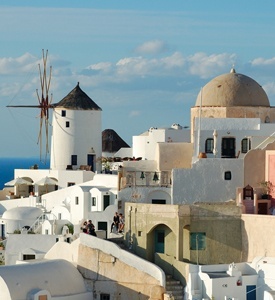 Greek Islands Cruise and Santorini. Honeymoon, Anniversary or just Romantic Vacation? 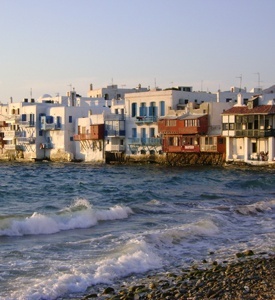 Experience the luxury of a cruise to Mykonos, Patmos, Kusadasi, Crete and Santorini and relax in romance in Santorini. Enjoy swimming during the Greek Islands Cruise and during the half-day Volcano cruise. Enjoy your coffee or dinner watching the world famous sunset from the Fira town. Upon arrival, you will be met and transferred to your hotel. The balance of the day at leisure. Continue and pass by the Prime Minister’s residence (ex Royal Palace) guarded by the Euzones in their colorful uniform, the Temple of Olympian Zeus, the Hadrian’s Arch, the Parliament and the memorial to the Unknown Soldier, the Academy, the University, theNational Library, the Constitution Square (Syntagma). 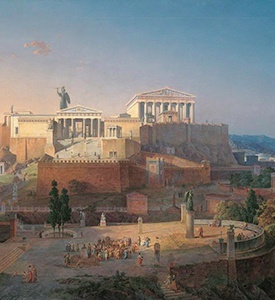 On the Acropolis visit the Architectural Masterpieces of the Golden Age of Athens: The Propylaea, the Temple of Athena Nike, the Erechtheion and finally “the harmony between material and spirit”, the monument that “puts an order in the mind”, the Parthenon. Morning transfer to Piraeus port to embark your selected cruise ship. Our cruise ship will leave the port of Piraeus at 11:00 for 3 full days of fun and experiences. We go along the Athens Riviera in the Saronic Gulf to the south end of Attica passing close to the Temple of Poseidon in Cape Sounion. This afternoon is a good opportunity to get around and know your ship and the services we provide. In the afternoon we arrive in Mykonos, known around the world as the Ibiza of the Aegean, the most popular destination of the Mediterranean. An international “jet-set” known for its beautiful sandy beaches, hundreds of tiny white chapels and incredible nightlife. Stroll around the streets of the capital that are considered the most beautiful of the Greek islands and enjoy the great nightlife. It’s easy to get lost in its maze of gleaming white walls dotted with blue domes and windows and balconies full of flowers. Have a coffee or a cocktail in one of the famous bars and promise to return for longer stay and more experiences. In the evening return to the ship for overnight travel to our next destination. Kusadasi is a resort town on Turkey’s Aegean coast. 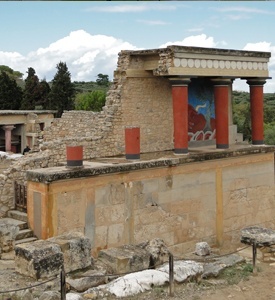 In ancient time settlers include the Aeolians in the 11th century BC and Ionians in the 9th century who made Kusadasi a centre of art and culture. In the early years of Christianity. St John the Evangelist and (according to Roman Catholic sacred tradition) Mary (mother of Jesus) both came to live in the area. With the included tour you have the opportunity to visit Ephesus, an ancient Greek city and later a major Roman city, on the coast of Ionia. The city was famed for the Temple of Artemis (completed around 550 BC), one of the Seven Wonders of the Ancient World. You can also visit the House of the Virgin Mary, purported to have been the last home of the Virgin Mary, based on the visions of Sister Anne Catherine Emmerich. It is a popular place of Catholic pilgrimage which has been visited by three recent popes. Then on to the island of Patmos, a small Greek island in the Aegean Sea. Patmos is a destination for Christian pilgrimage. Participating in the optional tour, you will have the opportunity to visit the Monastery & the Grotto (the Cave of the Apocalypse) of St. John, where he lived and recorded the Book of Revelation. Today we visit the magnificent island of the roses, Knights and Butterflies. 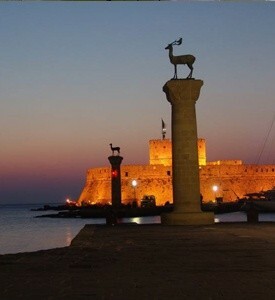 Rhodes was famous worldwide for the Colossus of Rhodes, one of the Seven Wonders of the Ancient World. The medieval Old Town of the City of Rhodes has been declared a World Heritage Site. Today, it is one of the most popular tourist destinations in Europe. The included tour will take you to visit the old medieval city and the famous Acropolis of Lindos. If you want to be on your own you can swim in one of the many beaches of the island or just stroll in the old city and imagine being one of its inhabitants of the ancient times. We will spend this morning to explore this beautiful city, the capital of Crete, the largest of the Greek islands. Archaeological treasures, magnificent ruins and museums, glorious beaches and fabulous restaurants make Crete a complete vacation spot. With the optional tour you will visit the ruins of Knossos, which in Minoan times was the largest centre of population on Crete and are located within close proximity or the Archaeological Museum of the city, one of the greatest museums in Greece and the best in the world for Minoan art, as it contains the most notable and complete collection of artefacts of the Minoan civilization of Crete. In the afternoon we arrive in the most breathtaking island, Santorini, believed to be the lost continent of Atlantis, one of the jewels of small volcanic archipelagos five islands. Santorini was created due to a volcanic eruption culminated in the explosion of a volcano caldera, therefore, its rugged landscapes dotted with huge cliffs. Santorini’s capital, Fira, with white-washed houses, narrow streets and open air cafes that cling to a steep cliff, is at the top of the beautiful island where you can enjoy the beautiful views of the bay. Discover Santorini villages that retain their authenticity, with beautiful blue and white buildings and barren volcanic rocks. It is a very fascinating and picturesque island. A magical place that has nothing to do with the rest of the Greek islands, a place to spread the peaceful and hospitable nature of its people. Disembarkation and transfer to your hotel. Day at leisure to enjoy the beach and know better this unique island. 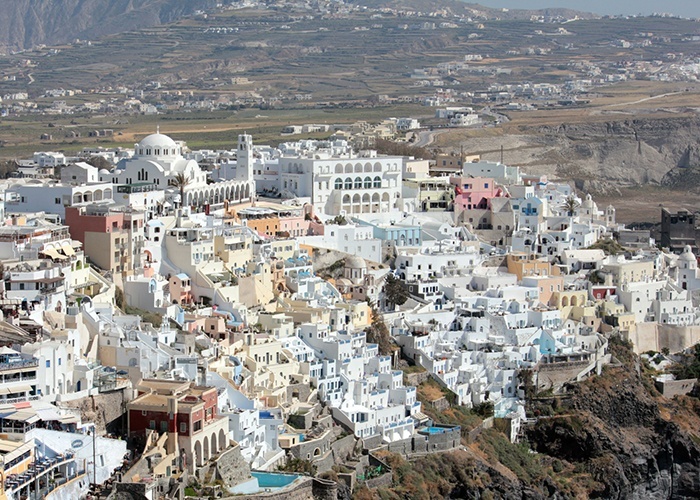 One of the jewels of small volcanic archipelagos five islands is undoubtedly Santorini. Santorini was created due to a volcanic eruption culminated in the explosion of a volcano caldera, therefore, its rugged landscapes dotted with huge cliffs. Not to miss the sunset from the Caldera nor the Greek and Mediterranean food in the islands restaurants and taverns. Today enjoy a half day cruise to the small islands of Nea Kameni & Palea Kameni located inside the caldera, the Hot Springs with the green and yellow waters (with free time for swimming) and the island of Thirassia. Pick up from your hotel and transfer to Vlyhada marina. Orientation with the boat and sailing on the south coast of the island. At the indicated time you will be transferred to the airport for your flight back to Athens for the connecting departure flight. * A special overnight tax of €4 for 5* hotels, €3 for 4* hotels, €1,5 for 3* hotels and €0,5 for 2* hotels per person per night to be paid by clients directly to the hotels in Greece.